Very happy with the product, price and delivery time! 2m Piggyback Power Extension Cable + FREE SHIPPING! Combining the convenience of a double adapter and an extension lead, these piggyback power cords are great in your home or office where they can provide distant access to power while leaving the mains socket available for use at the wall. 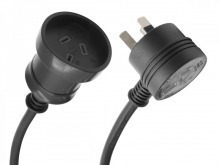 A robust piggyback extension cable that combines the features of a double adapter and power cord. Timely manner was an understatement, less than 24 hours and I had the cables I order. Amazingly fast service.